When you need to convert CAD files to usable PDF or TIFF Total CAD Converter is the best solution. It converts DXF or DWG files very accurately and is very easy-to-use. Let's see how it works. Launch Total CAD Converter and select the folder with CAD files in the file tree. The contents of the selected folder will appear in the main panel as the list of files. 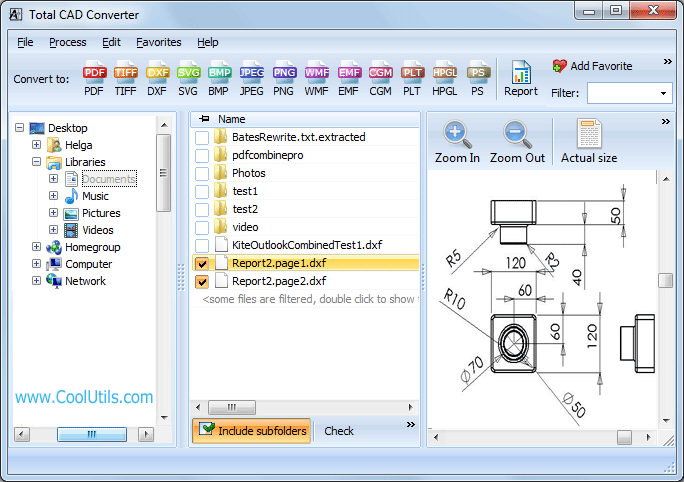 Total CAD Converter supports dxf, dwg, plt, hg, hgl, hpg, plo, hp, hpgl, hp1, hp2, hpgl2, gl2, spl, prn, svg, cgm file types. Select the file you need to convert and press the target format button (i.e. PDF if you want to convert dxf to pdf). 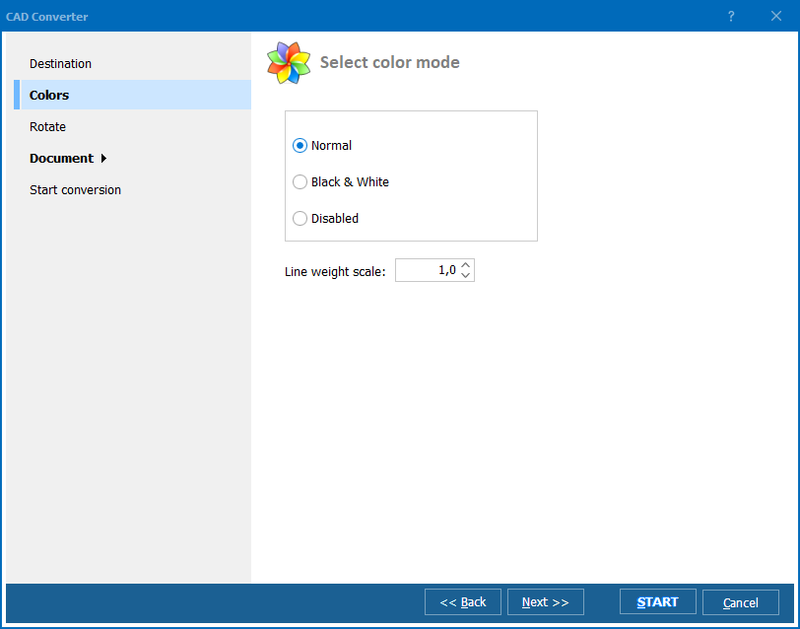 The wizard of the program will appear to help you make all the settings (Destination, Resize, Compression, Paper size, Orientation, Properties). Destination. Here you set the new file name and select the destination path (where to place the output files). Resize. This step allows resizing images to specified size. Set the desired dimensions in pixels if you want to resize your image. Compression. Here you can specify the compression filter for PDF files. That option lets you save some space by compressing images in the file. Note that CAD files often contain vector graphics that can not be compressed. Total CAD Converter will compress raster images only. Paper. You may select the size of the output PDF file here. It's A4 by default. Orientation. Would you like your file to be in portrait or landscape mode? Properties. You may set the PDF properties like Title, Author, Subject, Keywords for the output PDF document. When all the settings are done press Start! button. The conversion process will be started. 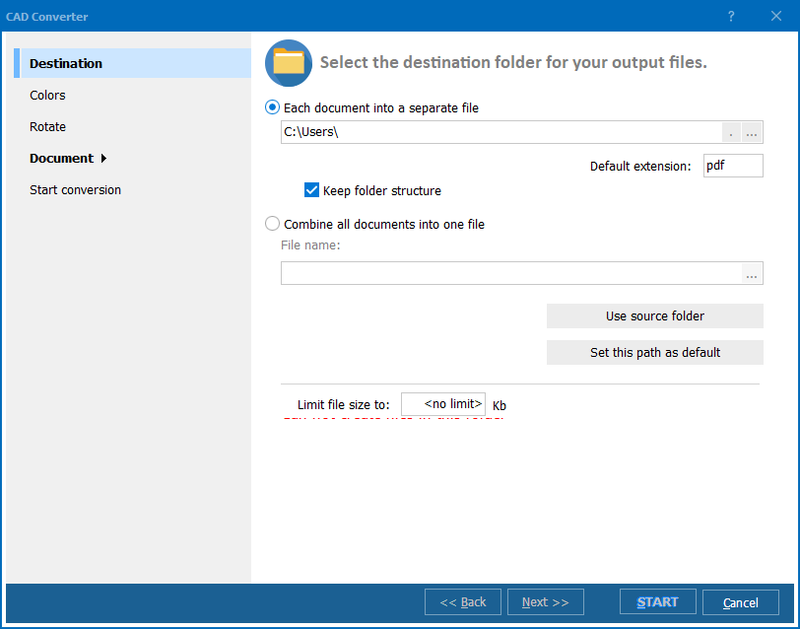 In few minutes find the output PDF files in your destination folder.